Would you buy Pierre-Emerick Aubameyang's custom Lamborghini? Aubameyang showing up for Dortmund training in a regular, non-custom Lamborghini. Borussia Dortmund fans can now drive off in one of Pierre-Emerick Aubameyang‘s distinctive luxury sports cars after the Gabon international put it on the market for €279,980. German daily Bild report that the striker has put his silver-painted Lamborghini Aventador, advertised as a ‘celebrity vehicle’, up for sale with a car dealer in Dormagen, near Cologne. The 28-year-old footballer has a weakness for fast cars, and there is no mistaking that the car belongs to Aubameyang as it has his distinctive lightening-flash logo on the bonnet. The luxury vehicle has a top speed of 350 km/h. Aubameyang, who has scored 12 goals in 14 league games this season, had the vehicle painted silver with a colourful rainbow matt effect. The footballer was suspended by Dortmund last month after turning up late for training which led to him being mocked by ex-Germany international Olaf Thon, who used to play for Dortmund’s rivals Schalke. “Anyone who drives such fast cars and then comes too late to training, well there is something wrong there,” said the 51-year-old, who was in the West Germany squad which won the 1990 World Cup title. 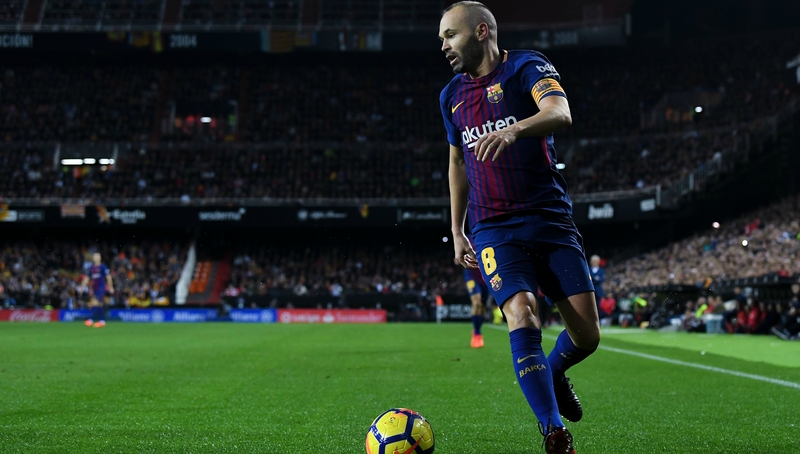 Barcelona midfielder Andres Iniesta admitted his late goal to knock Chelsea out in the Champions League semi-finals in 2009 is one of his best memories ahead of his club’s return to Stamford Bridge. The sides were paired together again in Monday’s Champions League last 16 draw with Barca travelling to London for the first leg on February 20. Iniesta’s last gasp equaliser eight years ago after Chelsea had been denied a series of penalty claims by Norwegian referee Tom Henning Ovrebo allowed Barca to reach the final on away goals as they completed the club’s first ever treble of Champions League, La Liga and Copa del Rey. “Great memories come to mind, some of the best that I could have experienced,” Iniesta said on Wednesday. Iniesta was absent through injury as Barca preserved their eight-point lead at the top of La Liga on Sunday. However, he expects to return for Deportivo la Coruna’s visit to the Camp Nou on Sunday to get match sharp ahead of an El Clasico clash with Real Madrid to end Barca’s year on December 23. “I’m more or less ok, if I was completely fit I would be with the team (training). It wasn’t really an injury but more of a niggle,” he added. Japanese side Urawa Reds secured fifth place at the FIFA Club World Cup UAE 2017 with a 3-2 win over Wydad Casablanca on Tuesday and it was this scorcher from Mauricio Antonio that opened the scoring for them. The Brazilian defender’s long-range effort proved a highlight on a night that saw him net a brace at the Hazza bin Zayed Stadium in Al Ain. “I’m delighted to have scored twice today, but I’m even happier with our win,” Antonio told Fifa.com after the match for fifth place. “Those two goals were fantastic, though. I’m used to scoring with my head, but sometimes I try my luck with my feet. And today it worked… twice!